If you had asked me six months ago what my favorite part of C.S. 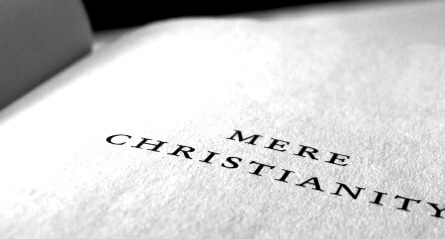 Lewis’s Mere Christianity was, you would have seen me turn every hue of embarrassed red and shrug my shoulders, averting my eyes and hoping the topic would change. “But it’s a Christian classic!” you would say in disbelief. And then the truth would come out. I’ve read The Chronicles of Narnia and his space trilogy, but the life-changing, foundational, non-fiction classics of Lewis I had only read in out-of-context quotes. I had my reasons for this, but the time had come. I had been out of college long enough that my brain, which normally craves intellectual stimulation, was turning to malt-o-meal. I decided to pick up Mere Christianity and go all out. I sent out a message to some random girl friends, many of whom didn’t know each other, but who I thought would enjoy diving into the depths of C.S. Lewis with me. I didn’t just want to read it. I wanted to digest it. To unearth the gems, separate the bad eggs, and discuss with people who would have varying but trusted opinions and perspectives. It is a small book, but not a quick/easy read. It would require time and thought and investment. Eight of us met the first Thursday night at a newish, still largely undiscovered coffee shop in town. This kept the pressure off of someone having to host in their home, and also gave us a defined ending time each night, because when the store’s doors closed, we went home. We ordered our drinks, made our introductions, and started on the first assignment of the book. It was very laid back: If you can come, come. If you can’t, don’t worry about it. I prepared an outline of each assigned reading for the week, which was my own accountability for myself to actually do the work. (That was, after all, my goal.) I would then read through the points and we’d discuss as something came up that we had thoughts on or questions about. Someone would pull out their 5,000 page philosophy book and contribute something beyond the collective intellectual sum of the group that would take us to a whole new level. Someone else would talk about their unique experiences in life that paralleled or contradicted what we were reading, and we’d, again, be propelled into a whole new level of thought and consideration . . . and admiration of Jesus Christ. So many provocative thoughts were dug up from a well deep enough to keep us talking until the shop closed. Lewis made points about why believing in the Christian God is even logical. Where the concept of morality comes from and how it has stood the test of time. How and why we require a savior. What living a virtuous life looks like as a Christian. And how we, as Christians, become more like Christ. The relevance of it all wove into all aspects of life, from politics to church, to raising kids, to marriage, to fashion, and recreation. 1. That Lewis had a sense of humor that is unique and made us all laugh. 2. That he refers to sexual relationships and analogies of war a lot to make points. 3. That the book really needs a revised version with better/updated editing. 4. That he had extremely well thought out and argued points which logically take you step-by-step through the principles and beliefs of Christianity. 5. That he had an uncanny way of making a very complex idea easy to understand through his use of real life examples. 6. That C.S. Lewis is not always right. I finished it so satisfied. I felt like I had been given smelling salts, triggering my brain awake again to the potency and complex simplicity of God and His work in us. Grab some friends, sip some chai, and allow your heart and brain together to mine the depths of who God is and what He’s done for us as Lewis has so poignantly defined in Mere Christianity. Take it one “book” at a time (the book as a whole is broken into small sections which he calls “books”). It’s very meaty. You will need some good time allowances for digestion. This entry was posted in Theology & Philosophy, Uncategorized. Bookmark the permalink.